Are more homegrown terror attacks inevitable in Canada? Editor's note: Ronald Crelinsten is an expert on terrorism and radicalization and the author of Counterterrorism. He is an associate fellow at the Centre for Global Studies at University of Victoria and Adjunct Professor at Royal Roads University. The views expressed are his own. 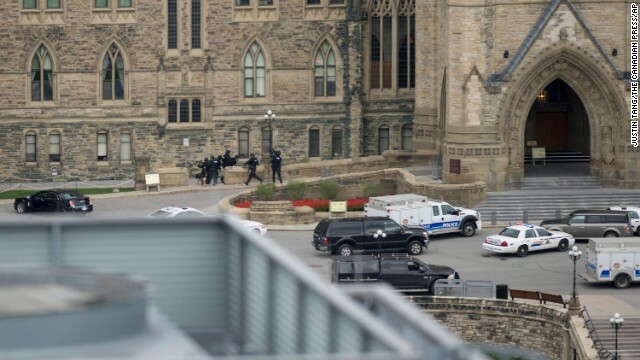 Last week's shocking events in Canada's capital, Ottawa, and in St-Jean-Sur-Richelieu, near Montreal, Quebec, confirm that the terrorist threat stemming from the Middle East knows no boundaries, and can take many forms. Yet while the Islamic State for Iraq and Syria, currently wreaking havoc in that region, has recently called for low-tech attacks in countries that have joined the U.S. coalition conducting airstrikes against them, this kind of threat is not new. Back in October 2009, al Qaeda in the Arabian Peninsula called for simple attacks with "readily available weapons such as knives, clubs or small improvised explosive devices". A few months later, as Stratfor notes, U.S.-born AQ spokesman Adam Gadahn issued a "A Call to Arms" for "grassroots jihadists" or "lone wolves" to strike targets close by rather than travel abroad, similar to the November 2009 attack by Fort Hood shooter Nidal Hasan. Two months later, Faisal Shahzad, a naturalized U.S. citizen of Pakistani descent, attempted to blow up a car in Times Square. And last May, two British citizens of Nigerian descent, ran over off-duty British soldier Lee Rigby in southeast London. They then hacked him to death with knives and a meat cleaver. Canada has also seen its share of terrorism, including both domestic and international terrorism, homegrown and imported, nationalist and religious, single-issue and revolutionary. The October Crisis of 1970, when the Quebec Liberation Front kidnapped a British trade commissioner and a Quebec cabinet minister, was the first political kidnapping in North America, and an early example of multiple attacks, long before al Qaeda entered the picture. Fifteen years later, the Air India bombing was the largest mass-casualty attack in aviation history before 9/11, while in 2006, a complex jihadi plot was foiled by good intelligence and the use of an undercover operative. Back then, a group of young men known as the "Toronto 18" allegedly plotted among other things to attack the Canadian Parliament and behead the prime minister. They were reportedly inspired by the online sermons of Anwar al-Awlaki, the Yemeni-American leader of AQAP killed by a U.S. drone strike in September 2011. Ironically, it was the threat of foreign fighters returning from Syria and Iraq to resume the fight at home, not the threat of homegrown terrorism, that in large part prompted the United States and its coalition partners to take military action against ISIS. But it might surprise many to know that Canada has seen perhaps hundreds of its citizens travel abroad to fight – the official number is 130, though it is probably higher. Dozens have reportedly returned so far, while some 90 individuals are reportedly currently under investigation as potential travel risks abroad or for radicalization at home. The man who ran over two soldiers with his car last Monday, killing one, had been identified as a travel risk and his passport had been revoked. Last Wednesday's shooter in Ottawa applied for a passport at the Libyan Embassy on October 2 (his father is Libyan) and, facing delays, cancelled his application. He had also applied for a Canadian passport and was reported to have expressed frustration about delays in that application, days before his deadly assault. All this underscores that we are now faced with the disturbing possibility that revoking passports of jihadi wannabes can have the unintended consequence of them striking at home instead. It has long been recognized that the lone actor who is not affiliated with any organization, and who self-radicalizes, usually via the Internet, is the most difficult to detect and to prevent from taking action. It is with this reality in mind that many feel that more attacks such as occurred in Canada last week are inevitable. The planned attacks are on a very small scale. American gangs cause more death and destruction to Americans than ISIS and Islamic fanatics ever could. Not even close. Not only is Sarah Palin a buffoon of historic proportions, she is also the undisputed queen of oral flatulence and verbal diarrhea !! Tea Party Patriots hail your queen !! Palin thinks Ebola is the new "E" class model from Mercedes. The Mercedes E-bola and E-coli. She also thinks that the movie Deliverance is an accurate depiction of conservative christian life in America. Well, It kind of IS. YouTube "Top Gear Challenge Alabama" and watch the video. Those are Palin voters. 10:22 & 12:54, not I. To the contrary, I believe with all my heart that Sarah Palin is a natural outstanding leader. The "so true" character is a troll of course. The most important thing Canada could do is not over react. The islamic use of the internet may bring out a few individuals with violent trends but in a just society never have an impact it has in a Iraq and Syria. In Iraq and Syria countries which have been ruled by brutal dictators for years and attempting to find their way out of the dark. We have not done them any justice with years of supporting the likes of Saddam. Our foreign policy ruled by corporate lack of clarity. If we strive toward the short term thinking the results might often look like what we have today. sorry for the interruption. Although present situation seams chaotic enough...Well do look back when Atatürk tried to get Turkey from the "share the pie" concept back in 1919. He did refuse the very authoritarian, dominant status of "Khalifa" to find the present Republic of Turkey. A resident leader of a religion is very HANDY. Almost like a Pope that you can dictate. Somebody bringing up the Khalifa situation means a LUNATIC for all Muslims. The person in question must be either from the family of Muhammed or be authorized by such connection. Because as I pointed before. No holliness comes on a person by self-deeclaraton. Well it was already said in Kuran anyway. no correct info is possible. Hence no inter-country-species comment. YET. Atatürk is the founding father of Turkey. His reforms propelled Turkey into the modern industrial age, revolutionized education, women's rights and established a secular government. However, after his passing, there was much corruption (Erbakan, Çiller, Mesut Yılmaz and many others come to mind). The Turkish economy struggled for a very long time. Unemployment, corruption, poverty were rampant and not being addressed. The current ruling party AKP was voted in twice democratically primarily due to sweeping positive economic changes. Whether that's good or bad, time will tell. I personally don't believe the AKP poses much threat to secularism, since we Turks value our personal freedom and liberties more than anything else. Still Ferhat, the Turks sorely need to grant the Kurds the independence they deserve. CNN and other global media outlets resorted to needless sensationalism, propagandist fear-mongering and self-serving interpretations of terrorism, using words such as “Terrified capital” and "besieged" to describe it. Beginning with urgent music, unmissable reminders that this is BREAKING NEWS of great importance, and the frenetic, breathless delivery we’ve come to expect from American news anchors in times of breaking news. Still going on with this? seems like its all CNN can talk about, no Canada will not become a police state, Canadians aren't afraid of anything and unlike Americans we won't turn our parliament buildings into a fortress. Had Canada done the right thing and stayed out of the fight in the Middle East, they wouldn't have to worry about such attacks, Daniel. The war in the Middle East was never their fight to begin with. Yeah, just like we had no business with Iraq. Indeed, the "Imminent Threat" mentality seems to be contagious. You see it all the time. These horrible Muslims out to get us mentality. The Ebola "crisis" that has politicians calling for travel bans etc. It's all irrational fear driven by corporate politics. Well said, Ferhat. How true that is! If she decides to run, and if elected, Sarah Palin wil solve our gobal as well as our domestic problems. She is a brilliant and marvelous woman, leader, and natural born winner. What's really scary is that you (and others) may actually think that. We just hope you're being sarcastic. But you probably aren't. That's why McCain lost the election. Palin is not capable. Agree @ Ferhat! And agree also @ bobcat, and now that theyve asked for our help we dont want to give it! All because the citizens of the US are war weary from all the wars we had no business in. Doesnt make this country look to well to our allies does it? I wanted to follow along and let you know how much I appreciated discovering this blog today. I might consider it a real honor to work at my company and be able to make use of the tips contributed on your web page and also be a part of visitors' responses like this. Should a position associated with guest article writer become offered at your end, make sure you let me know.